This recipe comes from a Toronto based Nutritionist Meghan Telpner. Carefully place whole cabbage leaves over top (inside the jar) to ensure it’s airtight. Seal jar firmly. It may be eaten right away but will improve with time. 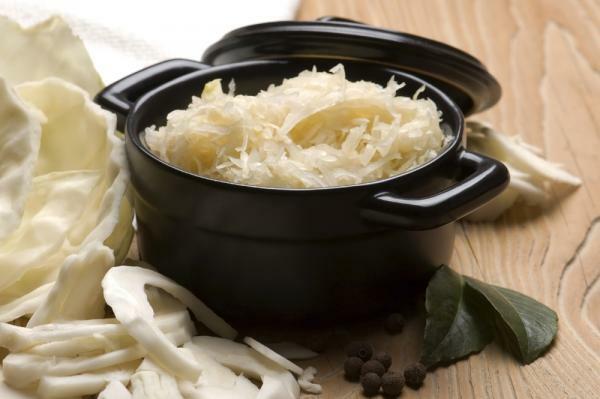 Sauerkraut may help heal your gut due to the probiotic content. As well as potentially improving digestive function, sauerkraut and other fermented foods can also support your immune system and mood due to the probiotic content. These bacteria, naturally found in our digestive tracts, have been shown to help regulate our immune systems as well as effect cognitive health. If you’re going to buy sauerkraut at the store, make sure to choose the refrigerated kind! The pasteurization that the shelf-stable brands go through kills all that helpful bacteria we’re trying to get into our diets. It can be found in many health food stores as well as online at Goodness Direct.